So the latest news in South East Asia is that someone claiming to be affiliated with Anonymous is waging a digital war against Singapore due to their proposed Internet licensing rules, which are akin to backdoor censorship. 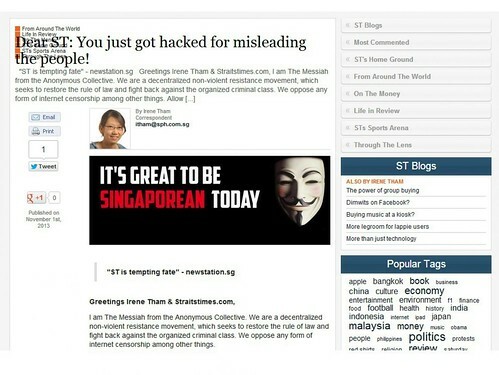 They already started by attacking one of the major Singaporean newspapers, the Straits Times – which was successfully defaced. The full protest and expected action by Anonymous should take place tomorrow, November 5th – the day synonymous with Guy Fawkes. It’ll be interesting to see if they target more corporations or governmental organizations, the media in Singapore lies somewhere between the two – with the majority of the mainstream media being owned in part or somehow controlled by the government. The licensing scheme seems to be some kind of effort to control the smaller or so called ‘independent’ or ‘alternative’ news outlets online, which do cause a lot of problems in oppressive countries. Singapore’s government, which has been formed by the same party for over 50 years, either directly or indirectly owns traditional media. The new rules have therefore been seen as an attempt to bring to heel foreign owned and independent sites which locals read for less-likely-to-be-sanitised news. Despite its façade as a shiny, modern Asian nation, Singapore ranks a lowly 149th on Reporters Without Borders’ Press Freedom Index 2013, sandwiched by Iraq and Russia. Singapore already ranks extremely lowly in the press freedom index, and this move, if successful, is likely to push it even lower. Singapore as a whole is known as being a pretty tech-forward and Internet savvy nation, so it’ll be interesting to see how tight their cyber-security is and if Anonymous can make any serious in-roads. As always we shall wait and see.